William D Nordhaus was together with Paul M Romer awarded The Sveriges Riksbank Prize in Economic Sciences in Memory of Alfred Nobel 2018, on Monday October 8th. The same day, IPCC released a special report, ‘Global Warming of 1,5 degrees Celsius'. 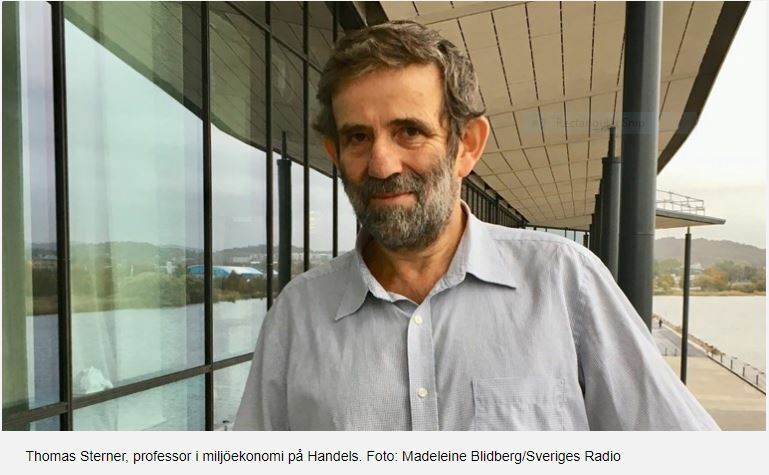 Thomas Sterner, Professor of Environmental Economics, University of Gothenburg, credits Nordhaus for his important contributions to Environmental Economics, but at the same says Nordhaus is not very radical in his calculations and conclusions. Paul Romer is also a pioneer when it comes to the development of macroeconomic models. His contribution is in particular focused on endogenous growth. His thinking helps us understand the mechanisms behind technical progress and will also be very important when the world needs to steer away from climate change but still maintain some economic growth. They have both contributed in different but complementary ways and the idea of sharing the prize is thus interesting and innovative. Both Nordhaus and Romer have developed methods for answering some of the currently most critical and challenging questions of how to create long-term economic growth and global welfare. Thomas Sterner likes the combination of them as prize winners. ‘Their research generate knowledge about what type of policies should be pursued in order to solve the global climate problem and at the same time give people a decent standard of living. Although Nordhaus is a pioneer and an important economist his work has also been criticized. He has, despite being a forerunner, downplayed the need for climate measures and has promoted policies that today would appear to pose a great risk to many people, according to Sterner. Nordhaus does indeed support the idea of climate measures and policy intervention, yet at a mild level with low climate taxes. ‘In his articles, he labels scenarios with a rise in temperatures of 3.5°C by the year 2100 (and a continued increase thereafter) as “optimal”. It is true that he says this assumes no surprising thresholds are crossed but many natural scientists believe that the risk of such dramatic changes is quite high with 3.5°C. His results are in stark contrast to the Special IPCC report Global Warming of 1,5 Degrees Celsius that was published on October 8th, which advocates for attempts to stick to the Paris agenda’s lower goal of 1.5°C rather than 2 °C. So, Nordhaus is not even close to these goals and considers 1.5 degrees totally impossible. About the 2-degree goal, he writes that it will not be possible to achieve “without negative emissions by the middle of this century”, something Nordhaus probably considers to be out of the question,’ says Sterner. Nordhaus was a pioneer and defined the climate issue as an important research field that he focused on in many fundamental articles in leading journals. In a way, he should have won the Nobel Prize a long time ago,’ says Sterner.